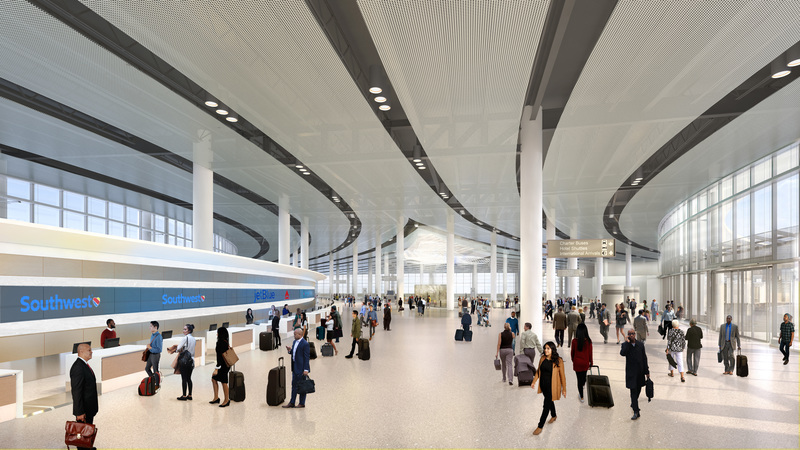 The new Louis Armstrong New Orleans International Airport is a transformative project that will drastically improve the first thing visitors see when they arrive in New Orleans. One major difference between the new terminal and the current facility is the consolidated security checkpoint. Because concourses are not connected in the current facility, each concourse has a separate checkpoint. In the new facility, there will be one checkpoint about the width of a football field with 17 lanes for TSA to use. 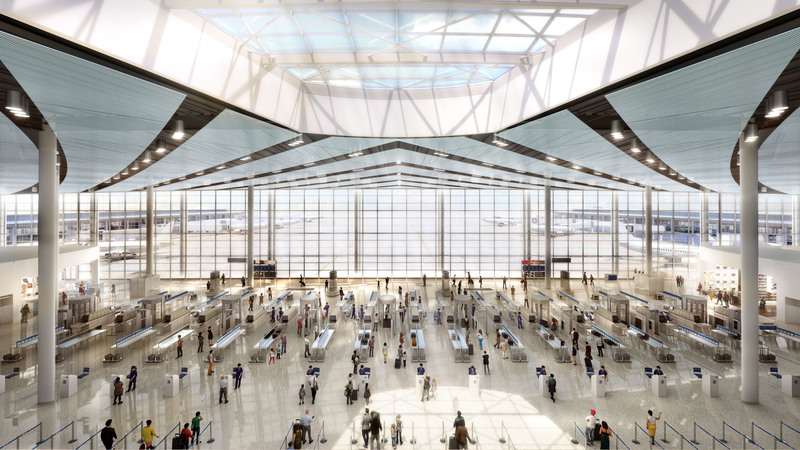 This setup will allow TSA to expand and contract as necessary depending on passenger counts, which could lead to more efficient processing allowing passengers to get to their gates faster with more time to explore the terminal. Once travelers process through security, they will have access to all 3 concourses and a wide variety of food, drink, news, gift and specialty retail options. The layout of the concessions down the center of the concourses is designed to convey an open and spacious feeling for passengers with an unobstructed view of the gates and airfield. Food and beverage concessions and news, gift, and specialty retail concessions will feature a mix of local brands representative of Louisiana and New Orleans and national brands that appeal to both the local and visiting passengers with varying levels of discretionary funds. Because the new terminal is designed to accommodate modern concessions facilities, passengers will have access to 45 concessions once they are beyond the centralized security checkpoint. Currently, passengers only have access to an average of 13 concessions beyond the existing security checkpoints at each concourse, which limits passengers to only those concession offerings on that particular concourse. In the centralized baggage claim area, passengers will be greeted with music on stage in an area dubbed the Jazz Garden. The new terminal will feature an enhanced entertainment program with live music throughout the day for all passengers to enjoy. Separate arrival and departure road systems will reduce curbside congestion and enhance passenger convenience. Consolidated Loading Dock improves security and reduces costs by improving overall operational efficiency. Dual Aircraft Taxi Lanes improves airline efficiency by reducing aircraft wait times preventing passenger waiting onboard the aircraft.